sediment during construction or from unsealed roads. This will influence the impacts to the waterway and the standard of construction required. For example, a bridge on a public road will have different requirements to one for internal farm access. If the bridge is open to the public or heavy vehicles, you will need to ensure it is designed to relevant Australian Standards. Bridges for lighter duties can have an alternative design. Both designs should be certified by an engineer as satisfying all relevant Australian Standards or Bridge Design Codes. 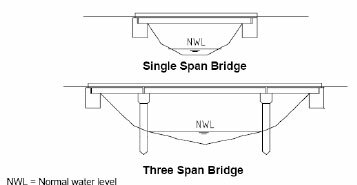 For bridges used for public access, the underside of the bridge beams should be above the maximum recorded flood level or the 1% AEP flood level. Clearance of up to 600 mm above the design flood level helps avoid damage to the bridge from floating debris. bridge supports don’t make a significant change to the waterway. Where these criteria cannot be met, you will need to find a qualified person to do a hydraulic assessment to measure the impact of the bridge. Single span bridges are preferred as they avoid disturbing the stream bed. They also reduce the risk of flood debris being caught on bridge supports that might threaten the stability of the bridge, or increase flooding upstream. Multiple span bridges may be required in some cases. provide rock beaching around the supports to reduce sediment being washed away. Road or track approaches should be at an appropriate level to ensure safe vehicle passage without obstructing flood flows. Hydraulic modelling maybe required to ensure here are no impacts on floodwaters or storage. Rock beaching is used on batters to protect sediment being washed away. This area is unlikely to revegetate because of a lack of sunlight and rain. Beaching should extend three metres upstream and downstream of the bridge abutments. The batter is to be excavated to the depth of the beaching to maintain the waterway area. The slope of the batter should be in the range of 1(v):1(h) to 1(v):2(h). In general, the beaching should extend to at least 600 mm below the toe of the bank to reduce undermining. To ensure enough light under the bridges for fish and other animals, the bottom of the bridge beams should be at least one metre above the base flow level in the waterway. Drainage from the bridge deck and access roads should be towards sediment basins or grass filter zones to trap sediment. It should not flow straight into the waterway. Where this cannot be avoided, piped or rock chute outlets may be needed. On dairy farm, the bridge deck and tracks are to be graded away from the waterway to a drainage recycling system. This is to stop animal waste going directly into the waterway. There must not be any direct connection of the dairy track to a stream or connected drain. Bridge railing or fencing is necessary for the safety of users. The type of railing depends on the purpose of the bridge and the risks of flooding. For public access bridges, the guard must comply with VicRoads standards. Where the bridge is above the highest recorded flood level or the 1% AEP flood level there are no restrictions on railings. Where the crossing is below this height, the railing should be designed to minimise capture of flood debris. For stock crossings a pipe rail or plain wire fence can be used. Mesh type fencing should not be used as it will catch debris and restrict flows.